I feel like my Gift Guide week+ went by so fast! It took me WEEKS to shop online and get everything I needed for each category and just like that its all over. I guess that's how Christmas morning works as well. All that planning, shopping and wrapping and in a few hours it's all over. Sad. 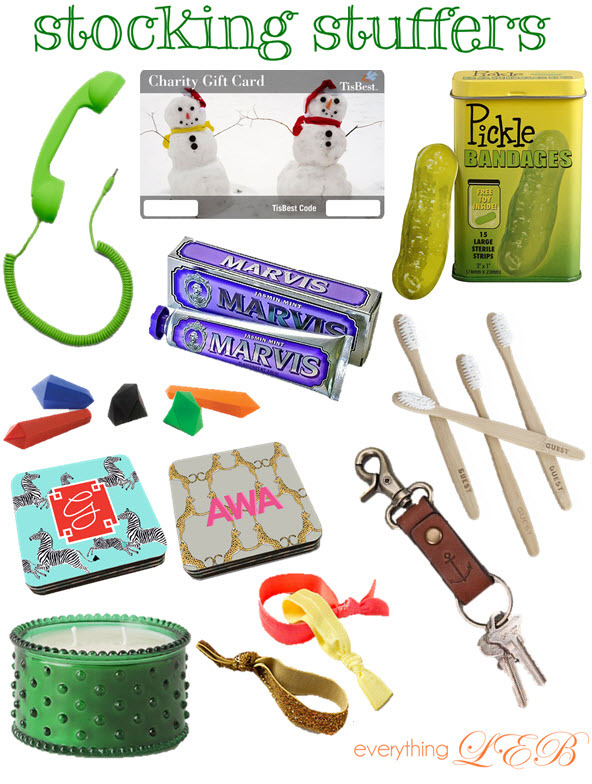 So many fun things to stuff into those stockings. You cant go wrong with a little Marvis toothpaste, and while you're at it those wood Guest toothbrushes are just too cute. I couldn't live without those hair ties, they are so much easier on my hair than normal ones- any girl with long hair would appreciate them for sure. Lastly, who doesn't love a monogram? Those coasters are animal friendly, colorful and will protect your coffee table. Whats not to love?!? I'm determined to make this holiday season last as long as possible. Just because this is the end to my posts doesn't mean that other bloggers are finished posting theirs. I also know the holiday decor posts wont be posted daily till Christmas- so I'm staying positive people! I need to check some of this out. The entire month of December is going to fly by.